The heavily forested Thai-Malay border has been a transit point for smugglers bringing people to south-east Asia by boat from Burma and Bangladesh. 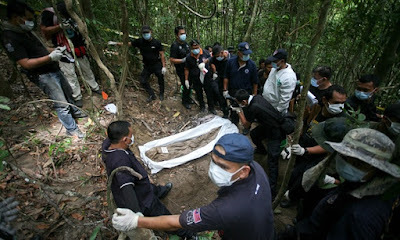 “Following on from the operation in which we found ... bodies of illegal immigrants, 24 more bodies have been found and dug up,” police said in a statement, adding that the remains had been handed over to medical experts. A crackdown by Thai authorities in May drove traffickers to abandon thousands of migrants on rickety, overcrowded boats in south-east Asian waters, triggering a regional humanitarian crisis that saw them land in Malaysia and Indonesia after being rescued by fishermen.